How do you teach robots, or artificial intelligence, to organically navigate the world around them? The standard model of robot training has been to provide your robot with specific sets of manual, pre-programmed, “IF/THEN” instructions (IF you hit a wall, THEN stop and turn around) followed by limited “STIMULUS / RESPONSE” experiences (set your robot loose in a room and let it learn). That’s not how we teach our children to learn. Human children learn much from their early reading, most of which is fictional storytelling. From Dr. Seuss’ One Fish, Two Fish, Red Fish, Blue Fish, and similar early books, children learn to count, identify colors, the concepts of objects (nouns) and actions (verbs). Later reading, from young adult to sophisticated literature, informs complex behaviors, expectations, life lessons and even moral codes. Fiction provides a wider range of content, context and emotional depictions than most direct, non-fictional, observations. Researchers at Stanford are having their A.I. 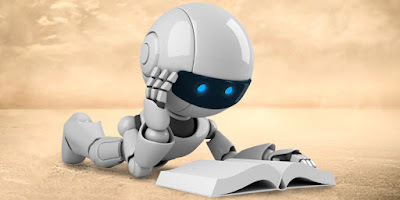 (artificial intelligence) program learn by providing it with fiction to read, a lot of fiction. And, the Stanford A.I., named “Augur” seems to “like” it. From smart homes that prepare coffee when we wake, to phones that know not to interrupt us during important conversations, our collective visions of HCI (Human Computer Interaction) imagine a future in which computers understand a broad range of human behaviors. Today our systems fall short of these visions, however, because this range of behaviors is too large for designers or programmers to capture manually. The Stanford researchers demonstrated it is possible for Augur to mine a broad knowledge base of human behavior by reading and analyzing nearly 2 billion words of modern human fiction from the online writing community Wattpad. Augur reads romance, science fiction, urban fantasy, and 20 other genre, all of which are set in the modern world. “Fictional human lives provide surprisingly accurate accounts of real human activities. Robots, and A.I., face a perplexing problem. They cannot sense the environment well enough to build a broad model of human behavior, and they cannot support the breadth of human needs without that model. Augur reads fiction — an ostensibly false record of humankind — providing sufficient information to hopefully break this stalemate. Though its reading, Augur captures behaviors across a broad range of activities, from drinking coffee, to starting a car, to going out to a movie. These behaviors represent concepts notoriously difficult to program. Does Reading Fiction Help A.I. Navigate The Real World? Recently, Augur used a camera to observe, and correctly identify, humans and objects. Further, Augur accurately predicted their behavior 71% of the time. That’s better judgement than most humans can deduce. Augur can predict many thousands of activities in modern contexts: for example, whether a user may be eating food, meeting with a friend, or taking a selfie. He uses these predictions to identify actions that people commonly take on objects in the world and estimate a user’s future activities given their current situation. Augur can command a phone to silences itself when the odds of you answering it are low, and he can dynamically adjust a music player to suit your current activity. Some A.I. already predicts human emotions better than humans can. See this article for more information, This Computer Reads People Better Than You Do. Facebook has engaged in a similar research project, providing its own A.I. with 2 gigabytes of children’s books to read. New Scientist reported that on February 18, Facebook released data that it uses to train its home-grown neural networks. One is packed with the text of classic novels, such as , Peter Pan, Little Women, A Christmas Carol. There are more than a hundred stories in all, taken from the free online library Project Gutenberg. Facebook hopes that providing its A.I. with these books will allow it to infer, and interpret, social interactions and to predict human needs. Not limiting the teaching to children’s literature, Facebook is also providing its A.I. with movie and tv trivia and text messages.